I wanted to create a short video that presents the ideas behind an equation that I came up with that properly presents what I call “Distance to Horizon”. I supposed the point of the equation is to have an accurate way to measure distances on ball since certain inaccuracies in other equations have been used to dismiss the evidence presented by flat earth folk. Once you have an accurate way to measure, it makes even the most entrenched skeptic open to the evidence. Another reason for this equation is to present what our experience should be like if we lived on a ball. Of course, one equation can only go so far. Empirical evidence needs to be collected and real scientific work need to be done to show the truth of our situation. With certain work already accomplished by individuals in the flat earth community, any contribution towards greater truth is a good thing. Hopefully this video can help explain this equation a bit better. Please let me know if any other work needs to be done on this equation. Over the past few months I’ve been working on the curvature equation for a circle. It doesn’t seem like very exciting stuff but it has enormous implications. During this process I thought I had found this equation but it turned out to be incorrect. I had fixed what I thought was the error but that turned out to be incorrect as well. The nagging problem stems from the way one would experience curvature if they truly lived on a ball. All the current methods of finding curvature don’t really have a good explanation and upon further study are shown to be calculating something other than curvature. So what do we mean by curvature? I will answer this question and provide a new and rational equation for curvature and show why the other equations do not work. 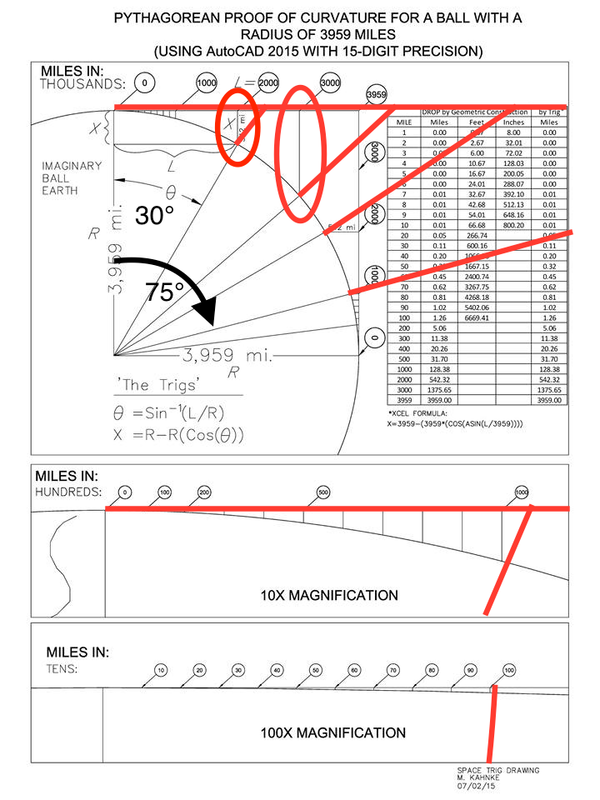 This famous document that has made the rounds in the flat earth community is not so much incorrect as it calculates an irrelevant number. Though it does properly calculate the value for X (or the “drop” along the axis), X is not the value we are looking for. As you can see, the line X is tilted so it is parallel to the axis. This is where the calculation becomes misleading. What we really need to do is extend the line in order to intersect the line of site projected from point 0 (in the Ball Earth Map document). Please see my curvature image to see an example of this. The equation “distance² x 8 inches / 12” does not solve for curvature but only for the hypotenuse of the distance: “Height = R-R*(cos(θ))” and “Length = sin(θ)*R”. Since these two values only represent the length and height of the distance travelled along the hypotenuse; and, since you cannot have a circle without height and length of equal value, you cannot have an arc without height and length of unequal value; therefore, curvature cannot simply be height (or the amount of “drop” along the axis) nor the value of the hypotenuse. As an example, 1° of circumference is equal to 24901/360°=69.1 miles. If we plug in that value to the equation we get “√((3959-3959*(cos(1°))² + (sin(1°)*3959))² = 69.09 miles. This is not the value for curvature. However, this does resolve the hypotenuse. The equation was being used to measure curvature by plugging in the arc distance (the distance travelled along the ball) not the hypotenuse; therefore, the resultant value will only solve the value of the hypotenuse. All we are calculating with this equation is the point at which two different lines of site intersect on a ball not the height required for an object to be visible from point A. Two points would intersect if we “forced the line” and built along the ground from each point (A and G). The two lines would have to be 3959 miles long. This is equivalent to a building at point D being 1639 miles in height. Since we build either along the surface or perpendicular to the Earth’s surface (i.e. buildings), we need to calculate something else. So what are we actually trying to calculate? If the hypotenuse is not the distance nor the length along the axis, then what is? The confounding problem is related to the line of site of the observer. Once we establish the position of the observer, all the other pieces fall into place. If you examine the image below, you will notice that a line of site moves away from point A towards infinity. So we need to take the observer as being at point A and does not move. Next, several dashed lines at various degrees have been drawn until they intersect with the line of site originating at point A. The equation ((1/(COS(θ)/R))-R) calculates the hypotenuse from θ to the point at which it intersects with the line of site from point A minus the radius. What we are calculating is the height necessary for an object to be above the surface, at a particular arc distance away or at angle θ, in order for it to be visible to the observer at point A. This is the key. As an example (if the ball theory is to work), as a ship goes over the horizon, the mast (and the rest of the boat) will begin to tilt as per angle θ. Though this is a tiny angle at first, it nonetheless must follow that angle. The mast does not start tilting back to stay parallel with the axis of the ball, it stays fixed to the boat. As the boat continues along the circumference, the mast would need to extend in height to remain visible to the observer at point A. This is an effect of curvature. In the diagram below, I put the original curvature calculation beside the equation I have proposed. You can see that at smaller distances the two values are very similar. However, as you move past 2° the values begin to diverge more rapidly. A simple way to calculate the “distance to horizon” is to divide the distance travelled by 69.17 miles which equals θ and plug that into ((1/(COS(θ)/R))-R). So what do we mean by curvature? For example, if I travelled from point A to G, I would have experienced 6225 miles of the total circumference but there is not 6225 miles of curvature between point A and G. If you look at line D1 – D0, you will see that there is only 1159 miles of arc height (or the maximum height of the arc between two points). It also happens to be the value of X at 45° or 90°/2. This works for any arc length. If you know the distance travelled, you can calculate the equivalent θ travelled. 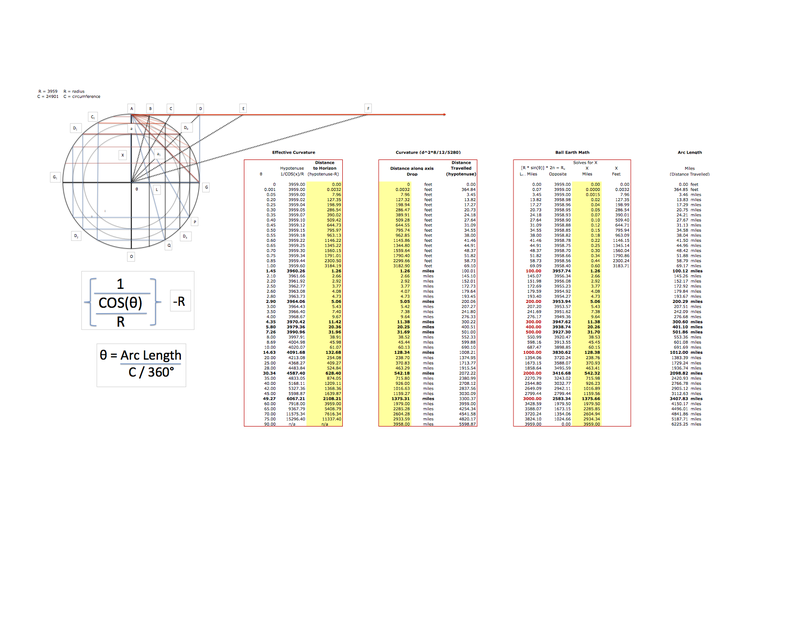 Using a variation of the Ball Earth Math equation, R-R(COS(θ/2)), we can solve for X which gives us the maximum height of the arc. At a distance of 6225 miles (or ¼ of the globe) the maximum height of the arc has been shown to be 1159 miles. In a similar fashion, the ship and the observer would have to lift off the surface at 45° and travel for 1159 miles to see each other. However, we can see that all this is doing is altering the line of site for both the boat and the observer. The definition of curvature is the degree to which a curve deviates from a straight line, or a curved surface deviates from a plane. The curvature of a circle is defined mathematically as the reciprocal of the radius (ie. κ = 1/r). All this tells us is that as the circle becomes larger κ becomes smaller. This does not help us figure out what the effect of curvature is to a person living on a ball. However, by showing rational examples I have demonstrated the effect of curvature is the height necessary for an object to be above the surface, at a particular arc distance away or at angle θ, in order for it to be visible to the observer at point X. Without altering the line of site of the observer and keeping the object (in this case a boat) on the surface of the earth, we can measure the effect of curvature. The problem of Polaris has been a stubborn one for those investigating the Flat Earth. The crux of this problem has to do with viewing angles, distances and elevation. Using trigonometry, one should be able to measure the height of any object from any particular distance. Unfortunately, the math just doesn’t seem to add up. Using the supposed radius of the Earth – which is 3959.16 miles – we should be able to figure out the height of Polaris based upon the viewing angle and distance from the North Pole. The two assumptions – the radius of Earth and the distance from the North Pole – are generally agreed to values from both FE (Flat Earth) and GE (Globe Earth) people. The viewing angle (“VA”) is where the problem starts – and ultimately will be resolved. GE theory states that the viewing angle of Polaris is equal to the particular latitude the observer views Polaris (ie. 49th parallel has a viewing angle of 49°). The distance from the 49th parallel to the North Pole is 2,597.55 miles or the radius of the Earth at that parallel. In the GE theory, the viewing angle is dependant upon the curvature of the Earth. In the traditional FE view, Polaris is approximately 3600 miles above the North Pole. However, the viewing angle from the Equator is supposed to be 1° but according to traditional trigonometry, the viewing angle should be around 42° – Hence the paradox (or in GE theory, proof of a globe). In examining this problem, I began by using a classic trigonometry set and drew, in 10° increments, the viewing angles from an object at 3600 miles above the North Pole. Several interesting anomalies appeared that, in the end, helped me resolve this problem. As the height of an object from a flat plane decreases, the angle of view decreases and tends towards infinity (law of perspective using geometry). As the observer increases distance from the object, the angle of view decreases. The viewing angle is inversely proportional to the distance from the object. As the viewing angle doubles, the distance to the object is reduced by half. An object of 3959 miles from a flat plane would have a viewing angle of 10° and would be at a distance of 22,962.2 miles. Observations 1-4 are all perfectly logical and fit well with the FE model. However, the 5 observation does not fit with known distances whether FE or GE. There is the possibility the FE model is incorrect but direct observations have shown that there is no curvature. We are right back in the middle of the paradox. The radius of the Earth (3.959.16 miles). All other numbers are generated using standard trigonometry and are without opinion or conjecture. The model is defined by 1° increments (1-89) and uses TAN, COS and ATAN functions to obtain either an angle or a distance. There are two main sections separated by a blue line. The left hand section takes each viewing angle (starting at 1°) use a TAN function (H/TAN(VA)) to derive the distance. For example, and object that is 69.101 miles above the observer, would have a VA of 1° and a distance of 3958.79 miles. This equation is applied to each VA up to 89°. I noticed that the VA and the distance are related to each other (see observations 3 & 4) up to and including the 32°. After that, the relationship doubles and the distance an observer is required to travel to double the VA is 4x the distance. I added a column that calculates the distance whenever the distance doubles starting at 1°. The distances correlate well but not perfectly. 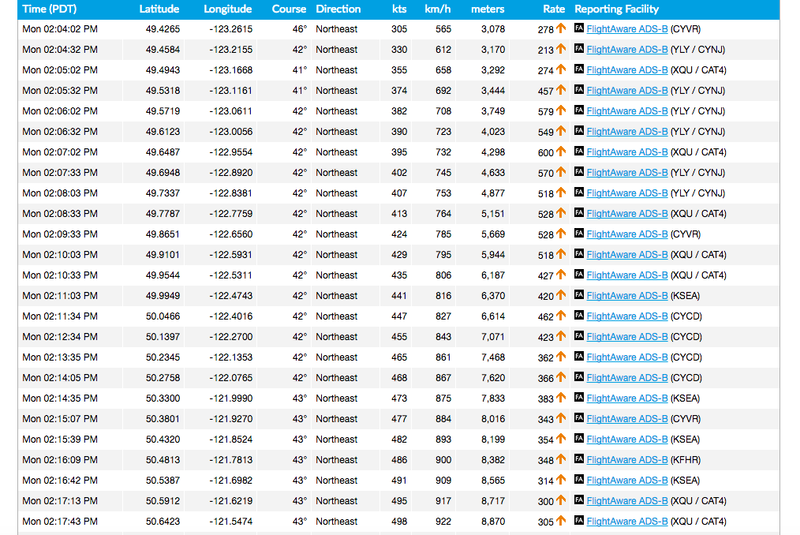 Plus, any differences increase as the distance decreases up to the 32° and then returns to normal after that. The distances are variable and change as the height of the object changes. By doing this, the actual VA is maintained and the distance alters the equation mentioned above. Another column (Apparent VA) was finally added but I will return to that one later as it is directly related to the solving of the paradox. The right hand column uses the radius of the Earth as the fix value (rather then the VA in the left side). To obtain the actual viewing angle based upon distance from object, I used an ATAN function – ATAN(H/R). The common value between both sides is the object height. I derived the radius of the Earth at each degree by the following equation [Radius of Earth*COS((Degree)/180*3.14159)]. This essentially flattens out the Earth into a series of concentric circles. Once all these relationships were in place, all I had to do was change one single value – the height – to see how the entire model behaved. The biggest pattern that I observed was the “compression” of VA as the distance and height increased. For example, at a relatively low height of 2 miles, all of the distances and VA matched the degree relative to the equator. However, as the height increased the VA began to “compress” at the lower VA values. As I increased the height, the VA differential (difference between the degrees from the equator and the actual VA) increased. You can observe the graph “Angle Differential” begin to form a SIN wave as the height increases. 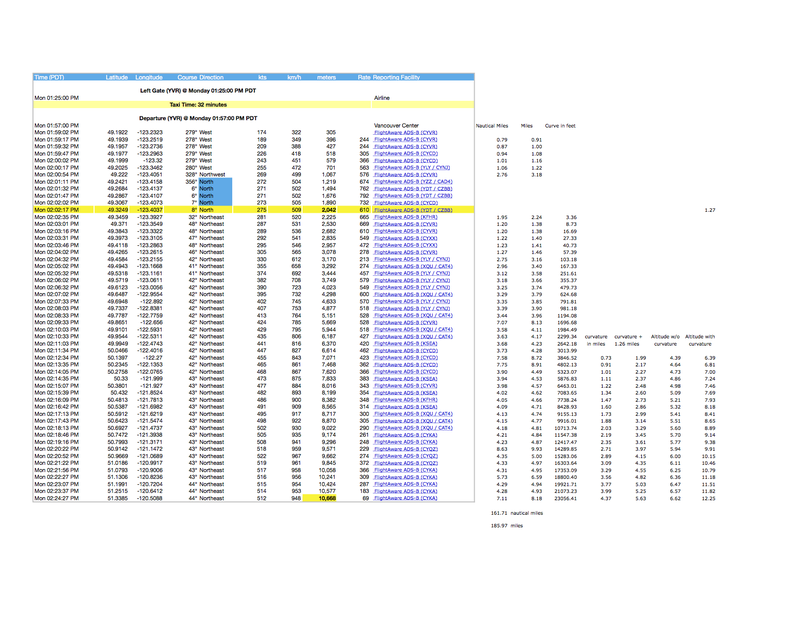 I haven’t taken the VA into decimal increments at the top and the bottom but my guess is that the pattern repeats. So how important is this VA “compression”? As it turns out, it makes all the difference in the world. The model suggests that VA on a flat plane do not operate the same as VA on curved surfaces. As the distance from the object increases, the change in the actual viewing angle per degree increases at a slower rate. Take the above example of 69.101 miles – the rate of change from 1° to 16° is only 1° of VA (33° to 34°). As we can see, the VA does not increase at the same rate as the degrees from the equator. Therefore, on a flat plane we would expect a variable VA per degree from the equator whereas on a curved surface it would not be variable. At 69.101 the VA from the equator is equal to 1°. However, as the height increases from this point, the VA becomes “compressed”. What do I mean by “compresses”? If you examine the “actual viewing angle” column on the right side of the model, you will notice that for the first 70° there is only a 3° change in VA. Within those first 3° the observer will notice very little change in the height of the object even over a great distance. It is only in the last few miles (from 76° to 89°) that any real movement in the object would be noticeable. The phenomenon becomes even more exaggerated as the object increases in height. As I continually increased the height, I found that the height of Polaris would be 2,513.5 miles above the North Pole. At this height, the VA from the equator would actually be between 32° and 33°; all the remaining degrees are hidden from view since they are “compressed” into a small area below that degree. Of course no actual compression is happening but it is a phenomenon of perspective on a flat plane. This video provides the mechanism with which the VA becomes “compressed” for objects near the horizon. An important piece to this puzzle is within the nature of the human eye. I have included two major references that the reader can take the time to read. The first is from Ian P. Howard (Perceiving in Depth, Volume 3: Other Mechanisms of Depth Perception, Volume 3 Chapter 26.4 .1(Effect of Height in the field of view)) and the second is Zetetic Astronomy, by ‘Parallax’ (pseud. Samuel Birley Rowbotham),  chapter 14. When looking at the horizon with the naked eye, (as opposed to using a telescope or binoculars) there are various laws of perspective that need to be considered. Let’s take another example with an object at a height of 2.571 miles above the observer. To achieve a VA of 1° the observer would need to be 147.29 miles from the object. The observer would then have to move half that distance – 73.65 miles – to achieve a VA of 2°. However, if the observer traveled half the distance again – 36.82 miles – the VA would become 4°. This continues at the same rate until the VA is 32° at which the observer is merely 4.60 miles from the object. To achieve a 64° VA the observer would have to travel 4 times the distance – 1.15 miles from the object. As we can see, the non-linear changes would have a direct impact on the VA based upon distance. We can put this model into practice through the observation and measurement of distant objects in relation to their height. 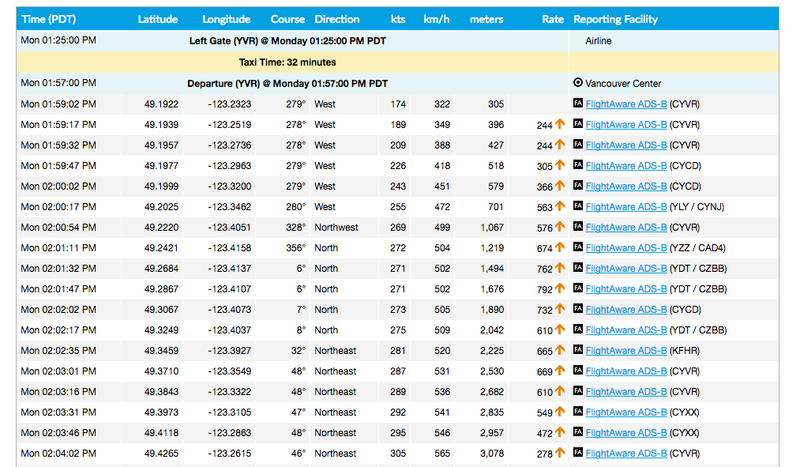 For example, from Vancouver, BC, the distance to Mount Baker is approximately 68.39 miles. This would mean the VA would be approximately 1.71°. As an aside, if we assume a curvature of the planet, 1/3rd of Mt. Baker should be below the horizon when observed from Vancouver. In fact, 3,184 feet of 10,781 feet of the mountain would be below the horizon. As anyone from Vancouver has seen with their own eyes, the entire height of Mt. Baker can been seen (from base to peak) from 68.39 miles. Take into consideration that 97% of the distance between Vancouver and Mt. Baker is traveled in the first 3rd of the VA (up to the 32°). The remaining 68° of VA occur during the last 3% of the journey. This will have an impact on how the human eye perceives objects at a distance. The VA is not constant. Because of this objects in the sky will appear higher or lower than they really are. For example, an airplane flying overhead at 500 miles/hr will approach the observer slowly at first and then begin to accelerate as the distance decreases. The airplane will reach maximum velocity (from the point of view of the observer) when it is directly overhead. The plane will then begin to decrease velocity as it moves away. We all know that the speed of the plane has not changed but the VA is changing. The more distance the plane gets the slower it appears to go. If we take this example and apply it to static objects (like a mountain) the same rules apply. However, the change in VA is due to the observer. As the observer approaches the mountain, the VA changes but at an inconsistent rate. At a great distance the mountain will appear to “rise” up from the horizon at a very slow rate until the first 32° of VA are completed. After that the mountain will begin to “rise” at an accelerated rate. If we now apply these observations to Polaris, we can see that 97% of the VA is far behind the Equator. According to the model, the star will rise at a much faster and consistent rate after the 32° (which the actual degree of parallel of the Equator). You have to imagine an observer that is 147,298 miles from the North Pole. At that distance the actual VA is 1°. It would take 97% of the journey before the star will begin to “rise” up from the horizon. After that point, the star “rises” and a relatively consistent rate (albeit not at 1° per degree of parallel – but close). Another important observation that needs to be taken into consideration is the human eye itself. It is documented that the total VA that the eye is able to perceive if the observer is looking directly at the horizon is 60°. In other words, the total field of view is only 60°. Also, the field of view also contains the ground beneath our feet. So within that 60° we have 100% of the field of view. It is important to note that the model being presented is scalable for any object at any height (assuming the radius of earth being valid). This means we can use this model to accurately map the surface of the Earth using an object at a constant height (ie. Polaris). meaning, if the mass increases then the product increases. For example, as a mass accelerates the value of F will increase. This can be seen in the extreme example of a mass that approaches the speed of light; as it approaches, it’s mass approaches an infinite value. The difficulty with this concept (as it is only a concept without any empirical evidence) is Newton’s 3nd law which states that “for every force there is an equal and opposite force”. If you take the 2nd law and apply it to any accelerating mass, you increase the total amount of force which also an increase in energy (e=mc2). Now if you take the law of universal gravitation (as shown above), and apply the 2nd law to m2, the total force between the two objects will increase. you can ignore the increase of r(radius) since the increase in radius is insignificant relative to the size of m1. In other words, an object like a rocket could not possibly launch if gravity acts according to the prevailing theory since the acceleration adds to the objects total energy (as shown above). By increasing energy you increase the force between m1 and m2 with a “…a force that is proportional to the product of the two masses” and with equal force (as per the 2nd law). Therefore for every pound of thrust an equal amount of force is brought to bear between the rocket and the earth. This would also apply to anything accelerating away from the center of the earth (ie. rapidly raising my hand above my head). In other words, gravity should be acting like a brake against the accelerating body. To “break free” (think of an inverted pendulum flywheel) of the gravitational force, an object would have to accelerate with a force greater than m1 * acceleration. Therefore, if we take two equal masses (m3 = m4) and accelerate one of them (m4) it would require the second mass (m4) to accelerate at a greater value than m3 * acceleration. Essentially, it is an application of e=mc2. This a far better explanation as to why the mass of an object increases as it approaches the speed of light – the mass itself is not increasing but the affect of gravity increases proportionally to the accelerated mass therefore the effective mass increases. The great irony here is that this makes gravity all but impossible since any object on the surface of a globe (ie. Earth) would be held fast against the surface. Anything pushing against gravity would encounter massive (no pun intended) resistance (like blood flow, plant growth, etc) to the point where no life could form. Nor could objects be buoyant. An object floating on the ocean surface is essentially accelerating away from the center of the earth (until it finds equilibrium at the ocean surface). The gravity of the Earth is far greater then the total outward thrust of the buoyant object (ie. air inflated beach ball). In a nutshell, buoyancy would be completely overwhelmed by gravity. As well, the lift experience by commercial airplanes would also be insufficient to overcome gravity. It needs to be an gravity sphere. So what about the distortion around objects on the earths surface? Is this not what causes gravity? Does space-time wrap around a cube or a oddly shaped stone? If the bodies in question have spatial extent (rather than being theoretical point masses), then the gravitational force between them is calculated by summing the contributions of the notional point masses which constitute the bodies. In the limit, as the component point masses become “infinitely small”, this entails integrating the force (in vector form, see below) over the extents of the two bodies. The portion of the mass that is located at radii r < r0 causes the same force at r0 as if all of the mass enclosed within a sphere of radius r0 was concentrated at the center of the mass distribution (as noted above). The portion of the mass that is located at radii r > r0 exerts no net gravitational force at the distance r0 from the center. That is, the individual gravitational forces exerted by the elements of the sphere out there, on the point at r0, cancel each other out. As a consequence, for example, within a shell of uniform thickness and density there is no net gravitational acceleration anywhere within the hollow sphere. So now we have a hollow uniform body and only the surface itself has gravity. So if all the gravitational forces are cancelled out as per the explanation above, then all the gravitational forces most somehow come from the surface. How is that even possible? Geometrically, the math flattens out the sphere by pushing everything to the surface so the concept of a larger mass having greater density and therefore greater gravity is expunged and we are left with flat plane – in essence. So does the math coincide with reality? If the math says all the gravity is on the surface, then is it really on the surface? I mean really only on the surface. If yes, then how could a surface, no matter how big, generate a sufficiently potent gravity field as to warp space-time? I was thinking about how airplanes would approach an airport and how they should look if on a globe. I was looking at various sites that talk about when a commercial airline (flying at 30,000 feet) starts it’s decent. At about 300 miles out the plane will start descending at about 500 feet per minute. If you could look 200 miles out with a powerful enough telescope, the horizon would equal about 5.6 miles. In other words no airplane could be seen since at that distance since 5.6 miles is the highest a plane normally flies. With that descent time, a plane would reach ground in just under 1 hour. It would be assumed that the cruising speed would also decrease since the average speed is about 500 miles per hour. Assuming that the average speed during decent is about 300 miles per hour and 500 feet is dropped per minute then at what distance should the plane be visible? After 30 minutes the plane will have dropped 15,000 feet (2.84 miles) and be 30 minutes out and 150 miles from the airport. Again, if you could look out that far with a telescope the plane would be at or below the horizon. Over the next 15 minutes the plan would drop another 7500 feet and be 75 miles out. At that point the plan should still be at or below the horizon. Over the next 7.5 minutes the plane would drop 3750 feet and be 37.5 miles out and 937.5 feet above the ground. Again, the plan would not be visible. Over the proceeding 3.75 minutes, the plane would be 18.75 miles out and 234 feet above the ground and still not visible. However, it is mostly likely that the decent and speed would be throttle to match the runway so the final few miles one would finally allow the plane to appear at the horizon. So what we would see would be the plane shoot upward from the horizon and then rapidly drop down. Of course this is an extreme example to demonstrate the idea. But the point it that if you watch airplanes approach airports they are always very high in the sky and slowly descend over time. They never shoot up from the horizon. What we do see is planes ascending or descending but never appear at the horizon. If someone was to film airplanes as they approach the airport, I can pretty much guarantee that not a single plan will shoot up from the horizon and then curve downwards toward the airport. On another note, whenever you see jet streams they are always straight. At plane at 30,000 feet will be visible for a shot period of time before it starts curving towards the horizon. They should have a curve in them. No ones sees that either.